Local doctor Dr. Henry Lynn Hook established a fund through a bequest in his will upon his passing in February 2014 to provide perpetual support to some of the causes closest to his heart. One of those organizations that Dr. Hook chose to support through his fund was the Simon Kenton Council of Boy Scouts of America. A lifelong scout and passionate about keeping local boys involved in Boy Scouts, Dr. Hook received his Eagle Scout award in 1941, was on the camp staff of Camp Falling Rock, and attended the first National Scout Jamboree in Washington, D.C. in 1937. As a member of the first organized Explorer Scout group in the council, he participated in the building of the lodge and cabins on Scout Island in Buckeye Lake in 1940-1941. His interest in Scouting resulted in a continued support of this organization throughout his life. Today, the Dr. Henry Lynn Hook Fund provides the scholarship dollars to accompany the Herman S. Bauman Scouting Achievement Award in memory of Herman S. Bauman, former Scout Executive of Licking County Council from 1923 to 1948. The award is given to one or more Scouts who have achieved the rank of Eagle Scout, reside in Licking County and have achieved an outstanding level of performance in the scouting field, or given community service as a Boy Scout which is above and beyond that expected of all Eagle Scouts. The award was given out for the first time at this year’s annual Mayor’s Breakfast on August 4. Nine nominations were received this year and two of those nominees were presented with the award. The 2016 Herman S. Bauman Scouting Achievement Award recipients are Mathew Scott and Nicholas Hubbell. Mathew Scott is a rising sophomore at Denison University and has been an active Boy Scout for ten years. He was extremely involved in high school as an official for Northridge High School Athletics, organizing blood drives, and participating in two Licking County River Round Ups, just to name a few of his endeavors. Mat is a shining example of a youth leader, holding the ranks of Assistant Senior Patrol Leader and Senior Patrol Leader, and Den Chief for Troop 24. Mat was the first scout from his troop to be elected into The Order of the Arrow. He has also served as a volunteer lifeguard at Camp Falling Rock for the past several years. Mat now serves as Assistant Scout Master for Alexandria Troop 24, his home troop. Nicholas Hubbell has been an active member of Boy Scout Troop 4020 for the past six years. 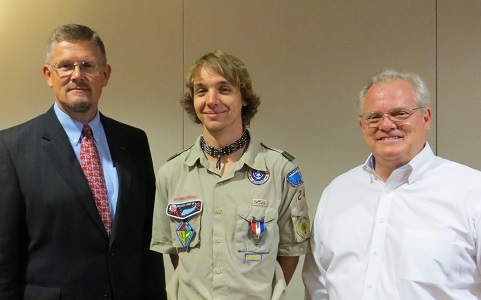 Nicholas exemplifies being a leader, both in Boy Scouts and in the community. He has served as Junior Assistant Scoutmaster, Senior Patrol leader, Order of the Arrow Kaniengehaga Chapter Chief, Order of the Arrow Vice Chief of Troops and Order of the Arrow Troop Representative. Additionally, he has worked as a summer camp staff member at Camp Falling Rock. Nicholas is passionate about giving back to his community, totaling 1,024 community service hours between 2011 and 2016. Nicholas is eager to continue his growth and has attended various leadership trainings in the community. He strives to follow and practice the Boy Scout’s oath and law in his daily life. The spirit and passion for Scouting of Herman S. Bauman and Dr. Henry Lynn Hook continues to live on through these determined Eagle Scouts. The leadership, community involvement and personal growth of these Scouts exemplifies the influence of Boy Scouts of America. Recipient Mathew Scott is pictured with Jeff Gill and Newark Mayor Jeff Hall.